Not using the conditioner on the day you have decided to go for hair straightening is the biggest ever mistake you have been making. Shampoo your hair and follow it with a good quality conditioner which does not over dry your hair. You should not use hair straighteners when your hair is wet. If you see steam or hear the sizzling of hair, stop there that moment. 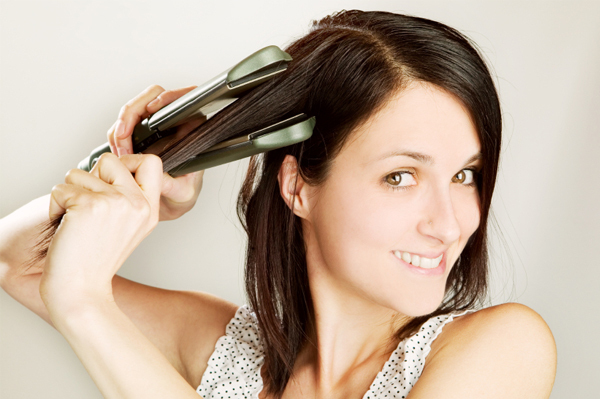 To get perfectly straight hair, you should first dry your hair completely. Yes, there is always the wrong and right way for everything in beauty regime. Wrong way of straightening your hair is when you stroke too much of flat iron on the same strand of hair. You should do it evenly. Every beautician does it and so should you! Part your hair in different sections with a bunch of hair in your hand. This would make the process easy and simple. Parting hair avoids confusion and double ironing of hair. If you think using the flat iron again and again on the same hair would give you the best results, you’re wrong! Using hair straighteners often won’t burn your hair but it will affect the quality of your hair. Finally, it depends on your need whether you need to repeat the process again. Many times the black residue on the flat iron remains ignored. But did you know the black residue on the iron is a build up of oil, grease, dandruff from your hair? Cleaning them is very important to maintain its quality. If you have cracked your iron temperature, you might be harming your hair. Usually 200-230 degree is used by any professional artist for high keratin treatments. For coloured and damaged hair you should pull down the temperature to 150 degree at max. It would be less damaging if you follow the above mentioned steps. Try to avoid these mistakes while straightening your hair. Happy straightening! I am guilty of styling my hair when they are wet. OMG nooo!!! That is the worst thing you can do to your hair!! OMG….I never use conditioner before ironing. My hair is super oily. Using conditioner makes my hair greasy the next day. What should I do then??? Any suggestion?? ?